Hot tub products such as water treatment chemicals and balancers are available to buy online. 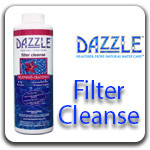 Choose from easy to use Mineraluxe or the standard Dazzle products. We are available to help you choose the products that are specific to your hot tub water needs. Simply call us or email us and we will be happy to help!